Cardinal and Archbishop of Canterbury Robert Kilwardby OP (c. 1215-1279) was a very important and influential thinker in his time, but he has not received the scholarly attention he deserves. In this book we present the first study of all of his philosophical works from logic and grammar to metaphysics and ethics. 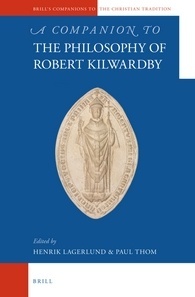 It contains a substantial introduction about Kilwardby's life and work as well as a comprehensive bibliography. The articles are all newly written by the foremost experts on Kilwardby today. The book should be of interest to any one studying medieval philosophy but foremost for scholars of thirteenth century philosophy.